Mike Helms' University of Oregon team was about to do battle with rival Washington State and his coach had one last message to relate, he told The Eugene Register-Guard. "He just told me to go out and play strong, and play with confidence," Helms told The Register-Guard. Helms, though, wasn't going out to play a baseball game, he was going out to play a basketball game. At that point, as a sophomore, Helms hadn't seen a baseball field since high school. 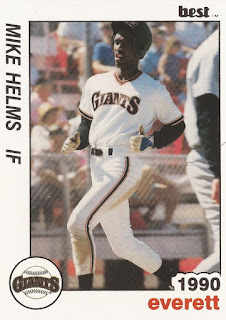 And he wouldn't see one again, not until the Giants had faith enough to draft Helms in 1990. Helms' professional baseball career, though, was brief. Helms saw time in just two seasons. Helms professional baseball career began that year in 1990, taken by the Giants in the 27th round of the draft, out of Oregon. The guard came out of Oregon having not played organized baseball since high school in California. But the pros kept their eye on him, and Helms kept his eye on them. By May 1990, Helms told The Register-Guard he intended to change games again and become a pro baseball player. "I've missed it a lot," Helms told The Register-Guard. Helms had been picked by the Rangers twice already, once out of high school and once the next year. But this time, after his junior year, Helms accepted the pro offer and signed. With the Giants, Helms started at short-season Everett. Whether it was his time away from the game or some other reason, Helms didn't hit. In nine games there, he hit just .118. Moving to independent Bend, Helms didn't hit much better. He hit .169 over 23 contests. In late July, though, he did help Bend to a victory with a single. Helms returned for 1991, but it was a brief return. Sent to the rookie Arizona League, Helms got into just one game. He went 1 for 3, ending his career.